Arthur Villeneuve was raised in a working class family in Chicoutimi. After leaving school at the age of fourteen, Arthur was hired in a paper mill, and then when he was sixteen he took a winter job as a "chore-boy" in a camp. Finally, in the same year, Villeneuve settled on a career when he became a barber's apprentice. By the age of nineteen he had already purchased his first barber shop, the Salon Champlain on rue Sainte-Anne in Chicoutimi and within three years his business was flourishing. These years of prosperity ended abruptly in 1944 with the death of Villeneuve's first wife, Simone Bouchard, and the loss of his properties. He became a barber at Hôtel-Dieu Hospital in Chicoutimi. In 1950 Villeneuve his second wife Hélène and his seven children moved into a modest sized house at 669 rue Taché, Chicoutimi. Arthur’s most famous early work is this house which he nearly completely covered, inside and out, with his first paintings. Arthur Villeneuve was inspired to become an artist after a revelation he had in 1946. This decisive moment occurred during the homily at Sunday mass, in which the priest quoted from a letter of Pope Pius XII. The purpose of the letter was to exhort the faithful to make full use of their talents. Arthur believed that he had, until then, left his artistic ability untouched, and returned home to set about developing his gift. 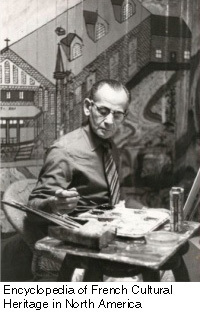 Arthur began painting frescoes on the outside of his house in April, 1957. Still working as a barber, he painted 100 hours per week for 23 months, until he had covered the front facade, the rear, all the interior walls and ceilings, and even the windows of his house. Located in the Bassin, a popular Chicoutimi neighborhood, the "Musée de l'artiste" [The Artist's Museum] was open to the public in 1959. Arthur Villeneuve welcomed visitors in his house until his death, in 1990. In 1994, the house was transported to an exhibition space at the Pulperie de Chicoutimi. The Villeneuve house is one of the most prominent pieces of the museum's collection. In 1965 Marcel Carrière of the National Film Board of Canada produced the short film "Villeneuve: Peintre-Barbier". Click here to watch the film. In 1972, the Montreal Museum of Fine Arts organized a major retrospective of his work and he received the Order of Canada the same year. 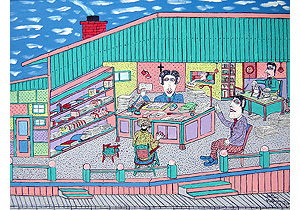 Ref: Boudreault, Nathalie, and Micheline Marion, Villeneuve : unhomme et sa maison, Chicoutimi, Les Éditions JCL, 2002 ; La Chance, Michaël, L'imaginaire du territoire dans l'art d'Arthur Villeneuve, Québec, Presses de l'Université Laval, 2007 ; Micheline Marion, Une maison pas comme les autres, Saint-Nazaire: Les Editions JCL inc, 1984; Jean-Louis Gagnon, Arthur Villeneuve: Le Génial, Published by the author; Pierre Demers, La Vie Simple du Peintre Arthur Villeneuve: Tete dans la legende et pieds sur terre. Perspectives: Le Quotidien du Saguenay-Lac-Saint-Jean: Vol. 20 No. 7, February 18, 1978; Bill Bantey and Françoise Saint-Michel (editors), Les Chroniques du Quebec: Arthur Villeneuve, Montreal: Gazette Printing Company (Ltd), 1972.